One of the underrated hard part about moving coins is figuring out where to move them to. At forkdrop.io, we maintain a directory of exchanges that allow deposit and trading of Bitcoin forks and airdrops. There isn't a single exchange that supports everything yet, so you have to go shopping for exchanges that fit your needs. As you should be aware, it is the Wild West out there, so you may have to use some services that aren't as polished as some of the premier exchanges you may be familiar with. However, as long as you manage your risk and don't move too much money at one time, you stand an excellent chance of getting your BTC or other preferred coin back out the other side. One criteria for consideration is maintaining privacy of the association between your identity and the BTC you hold. Many exchanges allow you to deposit, sell and withdraw BTC without providing more than an email address or mobile number (that is capable of receiving an SMS). However, a possible downside is that you are less likely to be able to get the best price since it narrows your selection of exchanges. Also, these are exchanges may be more risky to use since they could be operating in the grey area of compliance with their local laws. However, many prefer this category of exchange for the privacy and convenience. On the main page of forkdrop.io, our Exchanges tab lists relevant exchanges. What we consider relevant are exchanges that trade one or more of these forked coins. In orange is a listing of coins that are not only trading, but are depositable on the exchange. The column in green are where the coin is trading, but there is no support for depositing the coins on the exchange. 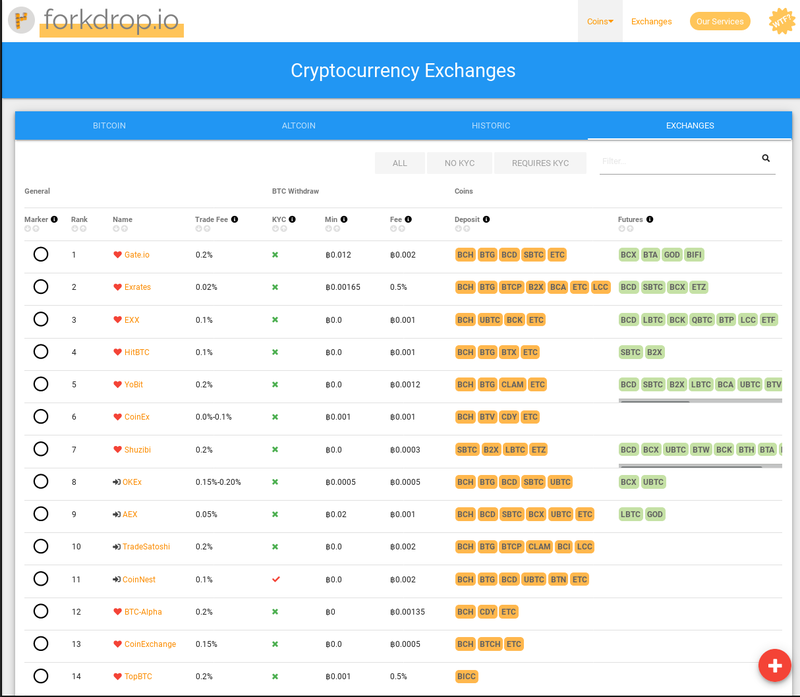 This table gives you an overview of the exchange that we are tracking for the most relevant details. Coin Support, KYC requirements, Fees, etc. You can visit our per-exchange listing for a more detailed view specific to the exchange. If you are signing up to an exchange, using our referral link helps support the site and this kind of content. We have provided referral links for all exchanges that have a referral program. 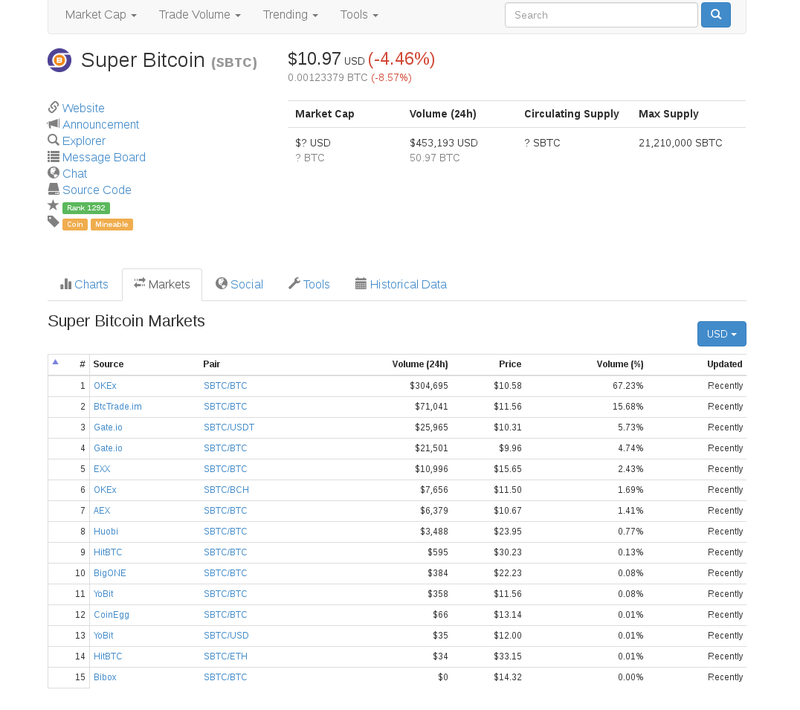 On our main page for coins, we link to the CoinMarketCap page for each coin where it exists. They also track the markets which trade the coin. Be warned that there is no distinction on CoinMarketCap between the exchanges that take deposits and those that only trade futures, which is important context for reading this information. 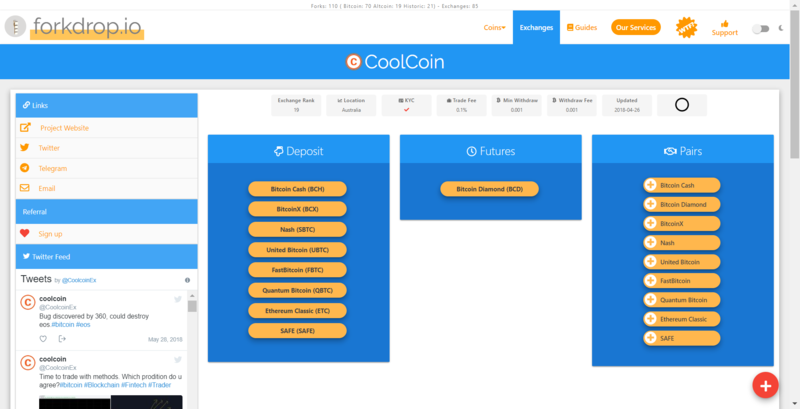 Also, taking a peek at an exchange's main page will also probably let you see the current prices for the coins they trade and possibly the full order book. That is often the only reliable source for the more obscure coins. Signing up to an exchange almost always requires an email. For a free web-based account that respects your privacy and anonymity and has some encrypted-by-default features, we recommend using Protonmail. We do not receive compensation for this recommendation, we simply believe it is an excellent service. It does not require you associate your account with a mobile number in order to register. 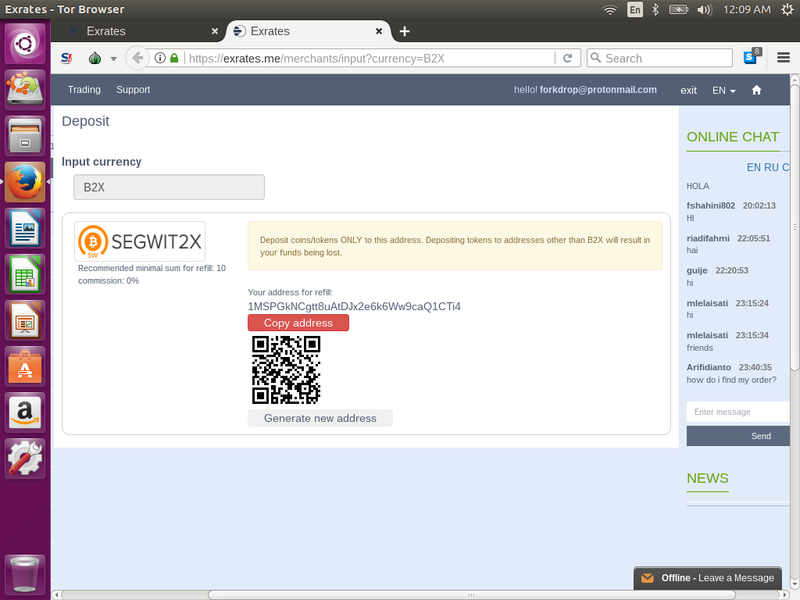 It is possible to use Google authenticator via the GAuth plugin for Chrome. However, it requires being associate with a Google account which requires a mobile number. When signing up, we recommend using the Tor Browser via a secure computing environment. 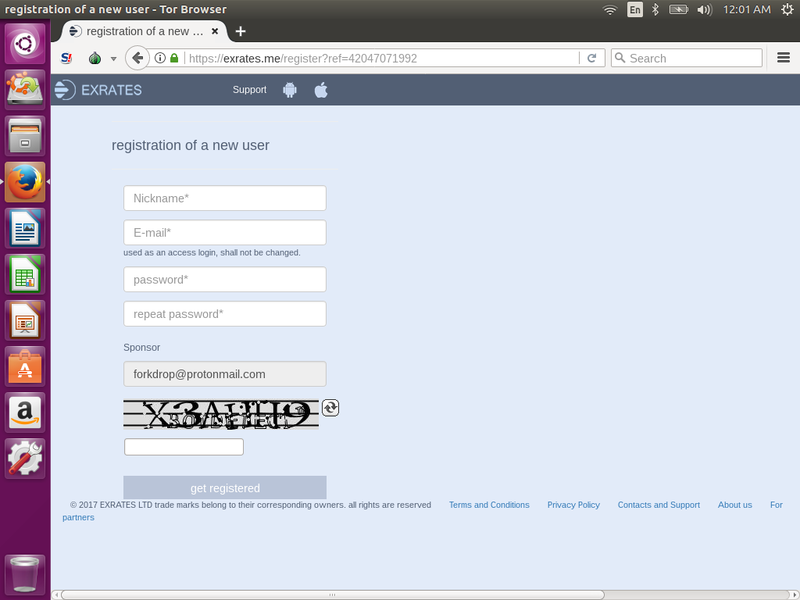 You can point your browser to their registration page (via our referral link, if you are so kind) and sign up. What is given to you is what you can the deposit address for the destination address parameter when setting up to use the bitcoin_fork_claimer script. 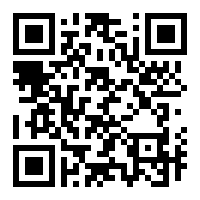 However be absolutely sure the address matches the coin you are trying to move. A lot of the coin's addresses look the same and it is possible to make mistakes and lose your coins by sending them to the wrong address.